The Republic of Malta (Maltese: Repubblika ta' Malta) is an island country located in the Mediterranean Sea between Italy, Libya, and Tunisia. 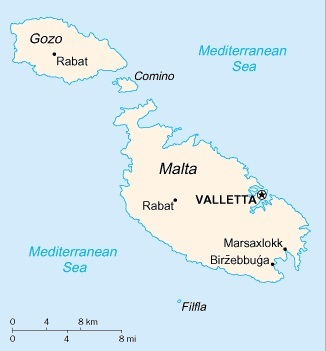 It consists of three inhabited islands - Malta Island, Gozo, and Comino (Kemmuna) - as well as a number of other uninhabited islands - Cominotto (Kemmunett), Delimara Island, Filfla, Fungus Rock (Il-Gebla tal-General), Ghallis Island, Islands of St. Paul, Manoel Island, Qawra Island and Xrob l-Ghagin Island. Malta is one of the most densely populated countries in the world. As of 2006, the estimated population was 402,000 - more than 3,000 inhabitants per square mile (more than 1,265 people per km2). 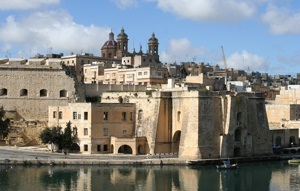 The capital and main port of Malta is Valetta, which as of 2005 had an estimated population of 6,315. The largest city of Malta is however Birkirkara (also known as "B'Kara"), which as of 2005 had an estimated population of 21,775. Discover these sun-drenched islands with the most incisive and entertaining travel guide on the market. You can take this handy, pocket-sized book out with you anywhere, any time. Whether you plan to explore Malta's record number of World Heritage Sites, relax on the burnished sands of Gozo's Ramla Bay or swim in the crystal-clear waters of the Blue Lagoon on tiny Comino, Pocket Rough Guide Malta and Gozo will show you the ideal places to sleep, eat, drink, shop and visit along the way. - Free pull-out map, as well as full-colour maps throughout - navigate Valletta's tight grid of streets or Gozo's bays and gorges without going online. - Itineraries - carefully planned days and weekends to make the most of your trip. - Detailed island coverage - whether visiting the big sights or venturing off the tourist trail, this travel guide has in-depth practical advice for every step of the way. Chapters cover each neighbourhood in depth, with all the sights and the best of the nearby shops, cafés, restaurants, bars and clubs. Areas covered include: Valletta; Floriana; The Three Cities, Vittoriosa, Senglea and Cospicua; Sliema and St Julian's; Mdina and Rabat; Central Malta (Attard, Balzan, Lija, Naxxar, Mosta); The North (Bugibba, St Paul's Bay, Mistra Bay, Mellieha, Mellieha Bay, Paradise Bay); The South (Zetjun, Marsaxlokk, Tarxien, Wied Iz-Zurrieq); Gozo; Comino. Attractions include: Hal Salfieni Hypogeum; The Grand Master's Palace, Valletta; Hagar Qim Temple and Interpretation Centre; St Paul's Catacombs, Rabat; The Blue Lagoon, Comino; The Blue Grotto; Dwejra, Gozo (The Inland Sea, Fungus Rock, once home to the Azure Window); Sliema-St Julian's Promenade; Fort St Elmo and the National War Museum; St. John's Co-Cathedral and Museum; Marsaxlokk Fish Market. 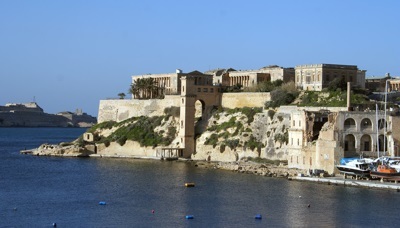 - Day-trips - venture beyond Malta to the neighbouring islands of Gozo and Comino. - Essentials - crucial pre-departure practical information including getting there, local transport, health, tourist information, festivals and events, and more. - Background information - an easy-to-use chronology, plus a handy language section and glossary. In Love with Malta The Hidden Treasures From the Author of the Number One Best Seller: ‘It’s a Long Way to Malta’ The hidden treasures of Malta, Gozo and Comino, little gems that you won’t find in other guide books, but define the charm and mystique of The Maltese Islands. There is something for everyone to enjoy from living it up in modern urban resorts to wandering leisurely in little traditional hamlets and villages dotted throughout the islands where time seems to stand still and you can linger awhile and relax in the warm sunshine. The perfect guide to the hidden treasures of The Maltese Islands. Flexi Map Malta is laminated, durable and has its own index that has been categorised for ease of use. From the historic capital of Valletta, to the crystal clear waters of Comino, to the ancient temple complex at Mnajdra, Malta has much to tempt the visitor. Insight Pocket Guide Malta is a concise, full-colour travel guide that combines lively text with vivid photography to highlight the best that this island has to offer. · Where To Go details all the key sights on the island, while handy maps on the cover flaps help you find your way around, and are cross-referenced to the text. · Top 10 Attractions gives a run-down of the best sights to take in on your trip. · Perfect Tour provides an itinerary of the island. · What To Do is a snapshot of ways to spend your spare time on the island, from exploring the island's many beaches and the Blue Lagoon, to marvelling at the Grandmaster's Palace, and enjoying some traditional fresh seafood dishes. · Essential information on Malta's culture, including a brief history of the island. · Eating Out covers the island's best cuisine. · A-Z of all the practical information you'll need.